Stylish high heels by Rascal. These slingback high heel shoes are in black faux suede with a gold-edged peep toe and over-toe motif. The stiletto heel and cork-effect platform sole are also in gold. Man-made materials. Stylish slingback high heels in black faux suede with gold edging, with a peep toe and over-toe motif. 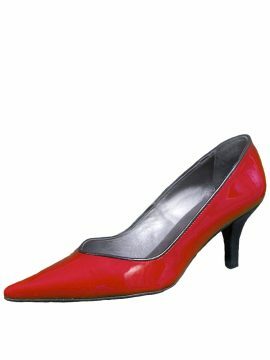 The stiletto heel is high at 5.5in, but the 1in platform gives the foot an elevation of 4.5in within the shoe. Great for evening wear but not too dressy to wear for daytime either. By Rascal. Sizes available: UK 3-8 (Eur 36-41).